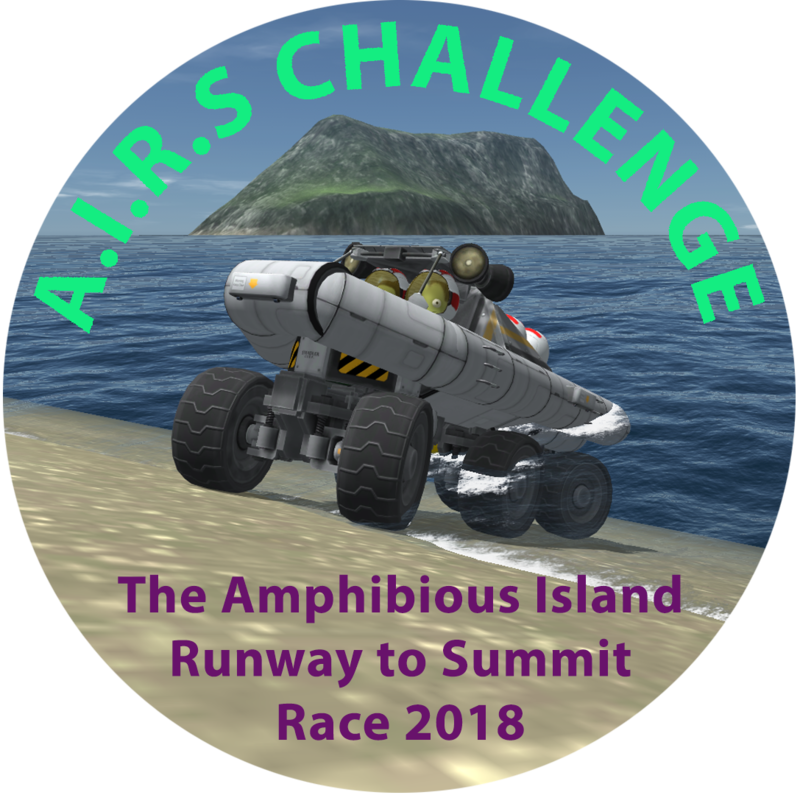 Race from the Island Runway to the next island over and plant a flag on the summit. The catch: you are not allowed to fly. 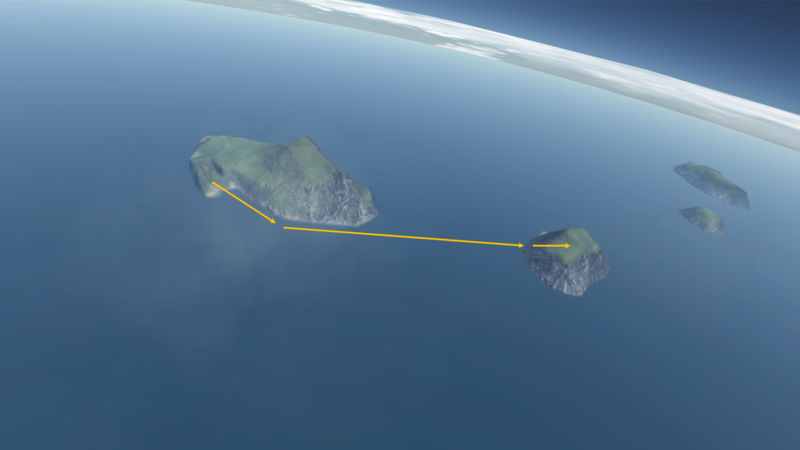 NOTE: If you have the Making History expansion, you can simply launch from the Island Airfield. If you do not, feel free to use whatever method (transport, hyperedit, cheat) you need to get to the island. 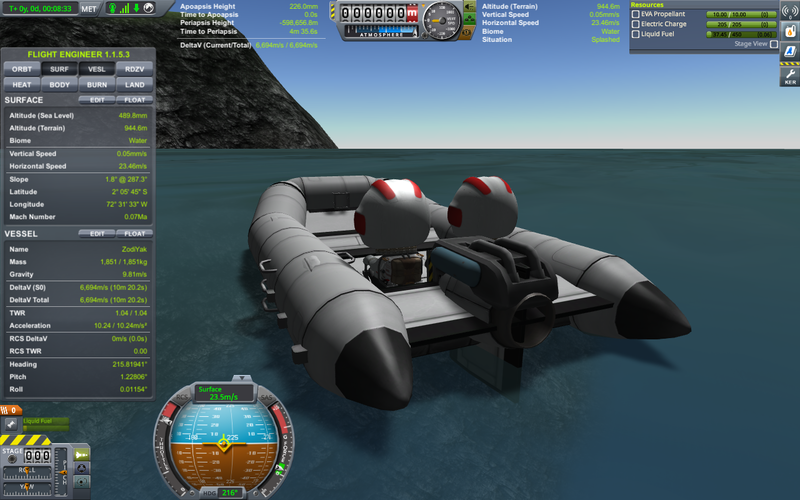 Since your craft will be amphibious, you can always drive it there. 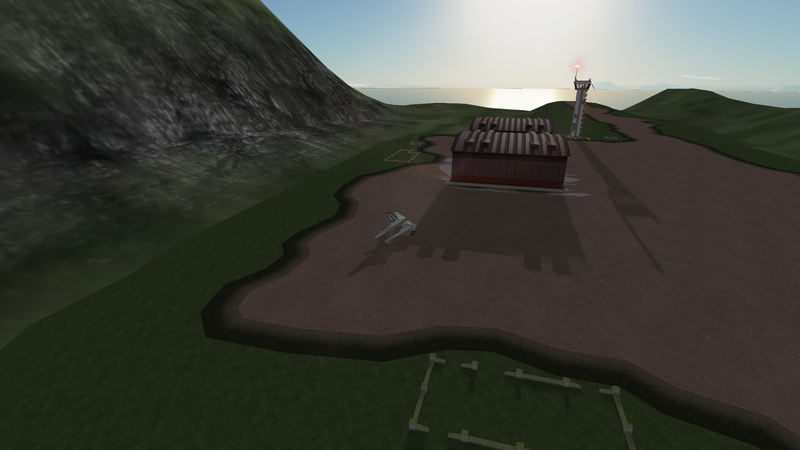 Start from where you see the aircraft in the screenshot below (anywhere on the east side of the hangar is fine). 1. You must launch from the Island Runway from the SPH. 2. You may not fly (as stated above) or take to the air in any manner. No ballistics. (Temporarily leaving the ground because you are driving too fast is okay). 3. You can go on the surface, make a submarine or drive along the bottom. Amphibious hydrofoils, speedboats, submarines and weighted rovers are the way to go. 4. You may only use one vehicle and you may not shed parts. So, no driving to an awaiting boat or driving a light buggy off a barge or shedding or dumping ore containers. What leaves the Island Runway must arrive at the summit. 4. You must plant a flag on the summit. The summit is at an altitude of 1050 meters. 5. 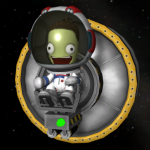 You need to get your vehicle onto the green, grassy part of the top of the island, but you only need to get your Kerbal and your flag to the absolute summit. 6. You can use whatever mods you want so long as they don't alter the physics of the game. 9. As always with my challenges: the spirit of the challenge is important. I cannot think of a rule for every exception. Be very creative but be reasonable. 10. @Triop has no excuse not to enter this challenge. 11. Once you have planted your flag on the summit, revert back your vessel and hit F3. That is your end time. 12. Complete the challenge and proudly display this amazing bit of graphic design work. 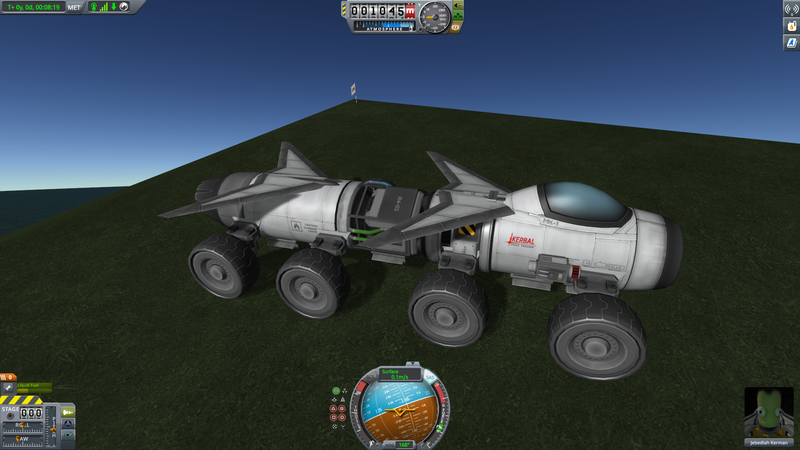 Well not so much for the design, but it does feature @XLjedi's most excellent amphibious vehicle. That requires the Making History expansion, doesn't it? Well I guess I have to enter this one now, don't I? It shouldn't. You just set the craft to take off from the Island Airfield and go. To be precise, I should state that the clock starts when you start moving. So, powering up and hitting the spacebar starts the clock. 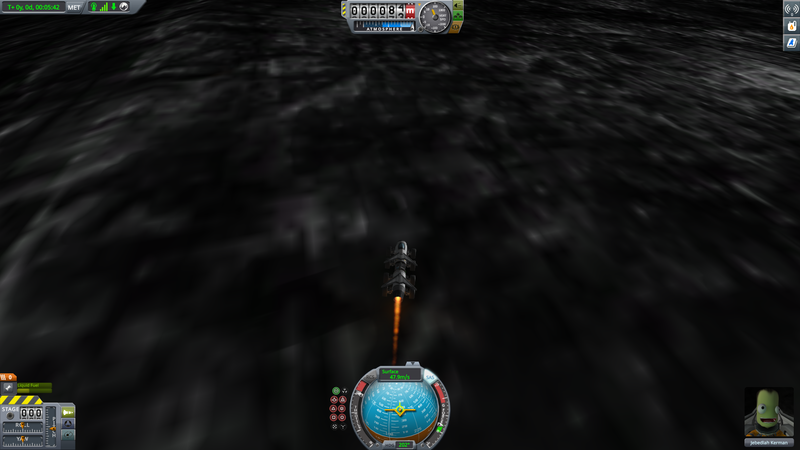 Unfortunately, when Jeb climbs out to plant the flag, he starts his own timer from zero. Anyway, just to get the ball rolling, here's a time of 8:19 - timed after planting the flag and jumping back into the rover. Shouldn't be hard to take a couple of minutes off that time. Good point. I'll have a think about how to do that a bit better. Awesome run. How do you invert the rover? 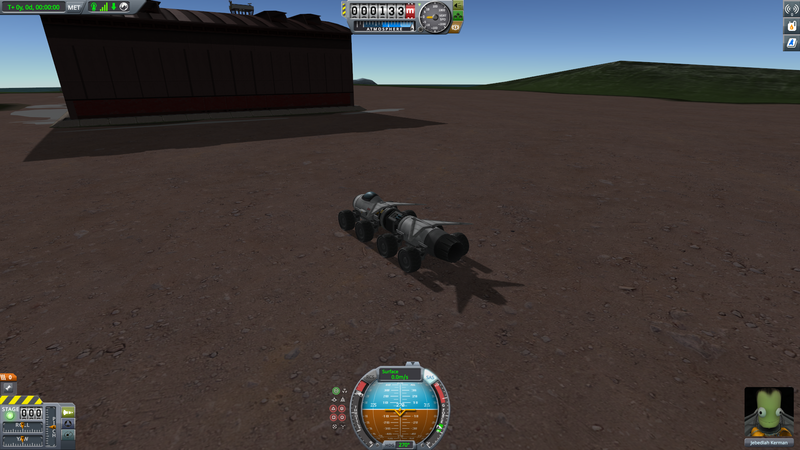 How do you invert the rover? Yeah - torque from the reaction wheel and the cockpit flips it really, really easily. Yet once it gets going, SAS keeps it pretty stable at 60 - 70m/s as long the authority limiters of the canards are set correctly. Range is about 300km. Notice this one is still carrying an ISRU. Unfortunately, when Jeb climbs out to plant the flag, he starts his own timer from zero. I set my clock to Universal Time instead of Mission Elapsed Time for these kinds of challenges (just click the button). MET resets whenever you go EVA or undock a craft. If you return to an earlier craft I think it goes back to that one's MET. Couldn't figure out how to get the game to do this last night; any tutorials available for us mere mortals? Sorry, I'm unclear as to what the issue is. Does your clock on the upper left corner of the screen not start counting when you launch a new craft? It does; my issue is figuring out how to start from the island runway. My sincere apologies for not being clearer there. 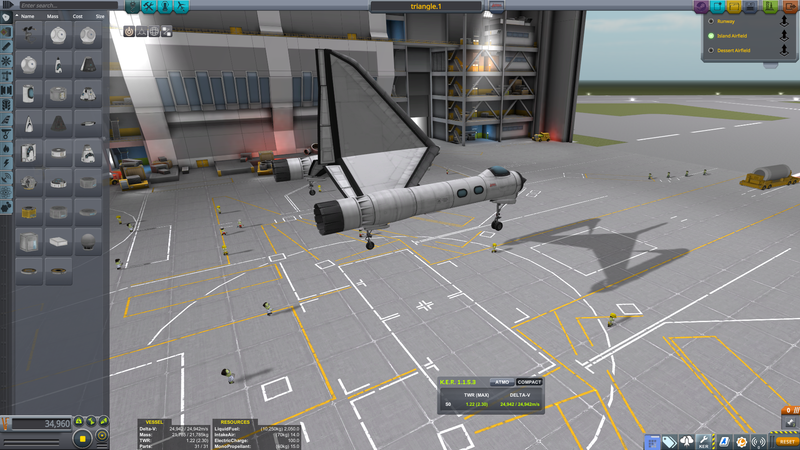 From the Spaceplane Hangar, you can choose your launch site. The Island airfield is only available via the SPH, so if you spend most of your time in the VAB, you would not have seen it. Go to the upper right corner where the launch button is, and you will see a small grey tab underneath. Click on that, and it should expand the tab to give you the options you see in the screenshot below. The Desert Airfield is only available in the Making History Expansion, but the Island Airfield is in an option in the stock game. I gave you incorrect information. I am sorry about that. I bought the expansion when it came out and only really started with aircraft after that, so I was making assumptions. That was awesome. I love the care you put into making that boat. At first I thought there was some mod parts in there, until I realized you are just really good at this Thanks for the great kickoff! @mystifeid, @sturmhauke Another option is to do F3 at the start and then, after planting the flag, change focus back to the vessel and take another F3. Nice work! I think you technically broke rule 2 a little there near the end, at about 12:35 in the video. But while I can't speak for the OP, I would certainly personally let that slide. He did not break any rules because the challenge does not start until you are at the Island Airfield. The flying ban is for the route from the airstrip to the summit. He does get cool factor points! I was talking about this leap at the summit. But as I said, I feel it's still within the spirit of the rules, if not quite their letter. Thanks! I don't think I'm gonna break any speed records with the attempt. It was a fun challenge though. As for the craft, yeah those were pre-existing designs and I only build with stock parts. The rover was built about a year ago. I like to make units that I can mix & match to accomplish various missions. So I think it's neat when a challenge comes up that I can attempt with units I already have in my fleet. 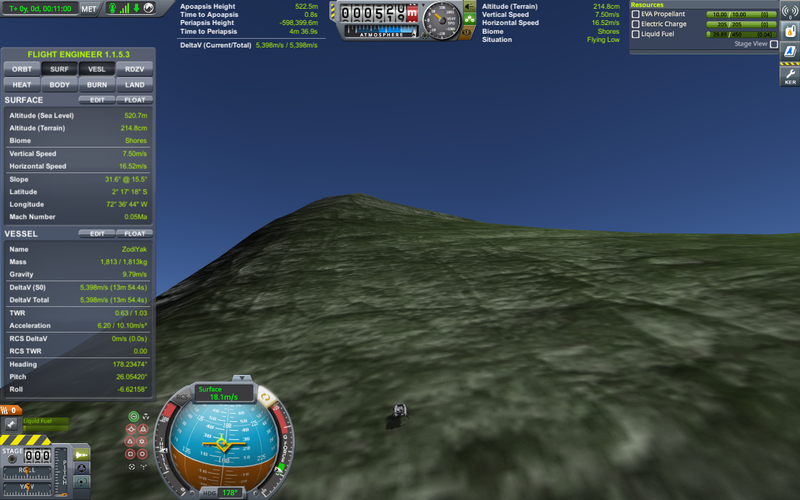 Another fun challenge is going to be returning that rover from the top of the mountain back to the KSC! Huh... hadn't even occurred to me. That was actually one of my favorite parts in the video! Scared me a bit though when I was actually doing it. 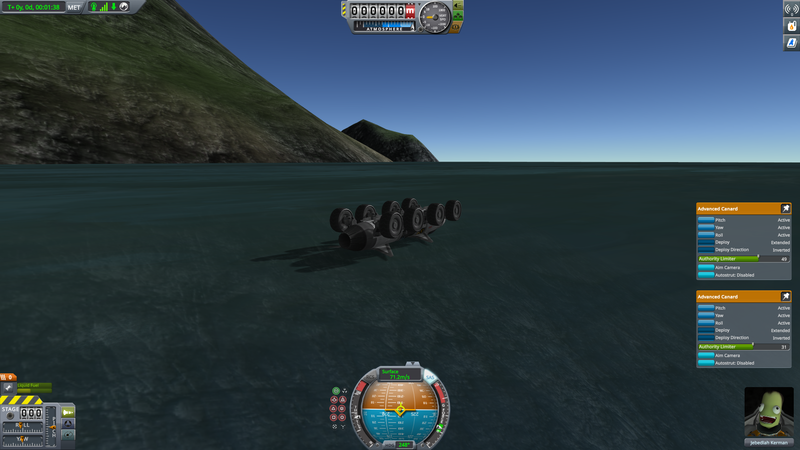 That craft doesn't do too well when it goes airborne and I misjudged the speed of the hill climb. ...and got that little moto-cross victory jump at the end. 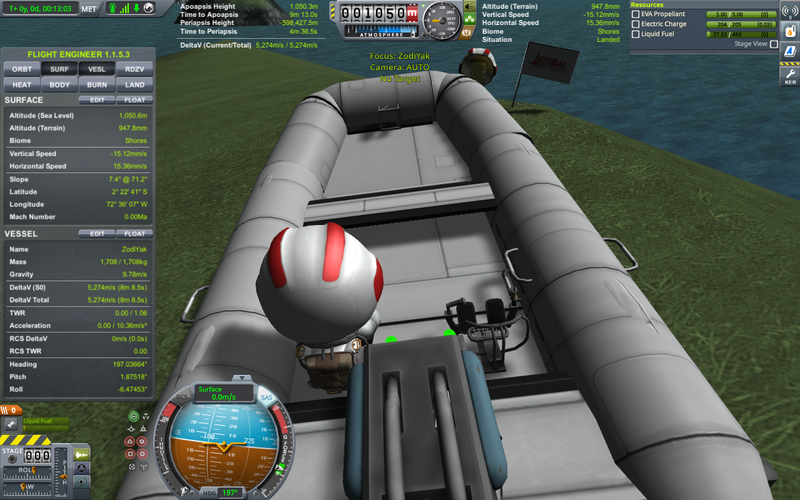 For maximum speed on water, press 1 to activate some flaps that stabilize it by adding a bit of extra lift to the front. Remember to turn them off again after returning to land, or you're likely to find yourself doing an unexpected backflip. To be honest, this design could probably use more engines. 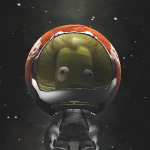 The single Juno is enough to push the boat up to over 60 m/s on flat ground (and to make it take off vertically, if you give it a chance), but on Kerbin's treacle-like water it only tops off at a little over 20 m/s. I hope that still counts. Yes, that''s why I always have a "spirit of the competition" clause. I've edited the rules so it is clear that is okay.